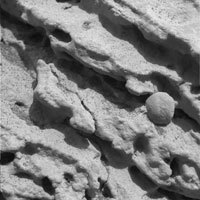 This sharp, close-up image taken by the microscopic imager on Opportunity shows a rock target dubbed "Robert E."
NASA's Spirit rover has begun making some of its own driving decisions while its twin, Opportunity, is presenting scientists with decisions to make about studying small spheres embedded in bedrock, like berries in a muffin. Both rovers are on the move. Late Sunday, Spirit drove about 6.4 meters (21 feet), passing right over the rock called "Adirondack," where it had finished examining the rock's interior revealed by successfully grinding away the surface. The drive tested the rover's autonomous navigation ability for the first time on Mars. "We've entered a new phase of the mission," said Dr. Mark Maimone, rover mobility software engineer at NASA's Jet Propulsion Laboratory, Pasadena, Calif. When the rover is navigating itself, it gets a command telling it where to end up, and it evaluates the terrain with stereo imaging to choose the best way to get there. It must avoid any obstacles it identifies. This capability is expected to enable longer daily drives than depending on step-by-step navigation commands from Earth. Tonight, Spirit will be commanded to drive farther on a northeastward course toward a crater nicknamed "Bonneville." Over the weekend, Spirit drilled the first artificial hole in a rock on Mars. Its rock abrasion tool ground the surface off Adirondack in a patch 45.5 millimeters (1.8 inches) in diameter and 2.65 millimeters (0.1 inch) deep. Examination of the freshly exposed interior with the rover’s microscopic imager and other instruments confirmed that the rock is volcanic basalt. Opportunity drove about 4 meters (13 feet) today. It moved to a second point in a counterclockwise survey of a rock outcrop called "Opportunity Ledge" along the inner wall of the rover's landing-site crater. Pictures taken at the first point in that survey reveal gray spherules, or small spheres, within the layered rocks and also loose on the ground nearby. NASA now knows the location of Opportunity's landing site crater, which is 22 meters (72 feet) in diameter. Radio signals gave a preliminary location less than an hour after landing, and additional information from communications with NASA's Mars Odyssey orbiter soon narrowed the estimate, said JPL's Tim McElrath, deputy chief of the navigation team. As Opportunity neared the ground, winds changed its course from eastbound to northbound, according to analysis of data recorded during the landing. "It's as if the crater were attracting us somehow," said JPL's Dr. Andrew Johnson, engineer for a system that estimated the spacecraft's horizontal motion during the landing. The spacecraft bounced 26 times and rolled about 200 meters (about 220 yards) before coming to rest inside the crater, whose outcrop represents a bonanza for geologists on the mission. JPL geologist Dr. Tim Parker was able to correlate a few features on the horizon above the crater rim with features identified by Mars orbiters, and JPL imaging scientist Dr. Justin Maki identified the spacecraft's jettisoned backshell and parachute in another Opportunity image showing the outlying plains. As a clincher, a new image from Mars Global Surveyor's camera shows the Opportunity lander as a bright feature in the crater. A dark feature near the lander may be the rover. "I won't know if it's really the rover until I take another picture after the rover moves," said Dr. Michael Malin of Malin Space Science Systems, San Diego. He is a member of the rovers' science team and principal investigator for the camera on Mars Global Surveyor. Opportunity's crater is at 1.95 degrees south latitude and 354.47 degrees east longitude, the opposite side of the planet from Spirit's landing site at 14.57 degrees south latitude and 175.47 degrees east longitude. The first outcrop rock Opportunity examined up close is finely-layered, buff-colored and in the process of being eroded by windblown sand. "Embedded in it like blueberries in a muffin are these little spherical grains," said Dr. Steve Squyres of Cornell University, Ithaca, N.Y., principal investigator for the rovers' scientific instruments. Microscopic images show the gray spheres in various stages of being released from the rock. "This is wild looking stuff," Squyres said. "The rock is being eroded away and these spherical grains are dropping out." The spheres may have formed when molten rock was sprayed into the air by a volcano or a meteor impact. Or, they may be concretions, or accumulated material, formed by minerals coming out of solution as water diffused through rock, he said. The main task for both rovers in coming weeks and months is to explore the areas around their landing sites for evidence in rocks and soils about whether those areas ever had environments that were watery and possibly suitable for sustaining life. JPL, a division of the California Institute of Technology in Pasadena, manages the Mars Exploration Rover project for NASA's Office of Space Science, Washington, D.C. Images and additional information about the project are available from JPL at http://marsrovers.jpl.nasa.gov and from Cornell University at http://athena.cornell.edu .